Palm Sunday. We come out the shadows of the Lenten season, for one glorious Sunday, shouting our glad “Hosannas!” as we commemorate Jesus’s triumphal entrance into Jerusalem. But even as we share in the glory-past, it is over-shadowed by what we know lies ahead. We will walk through the valley of the shadow of death. Holy Week. We will trace the footsteps of Jesus from that brief exultant moment of waving palm leaves and shouting crowds: “Blessed is He who comes in the name of the Lord!” We will descend with Christ, figuratively speaking, through His last days and last hours, through the shadows into complete darkness. 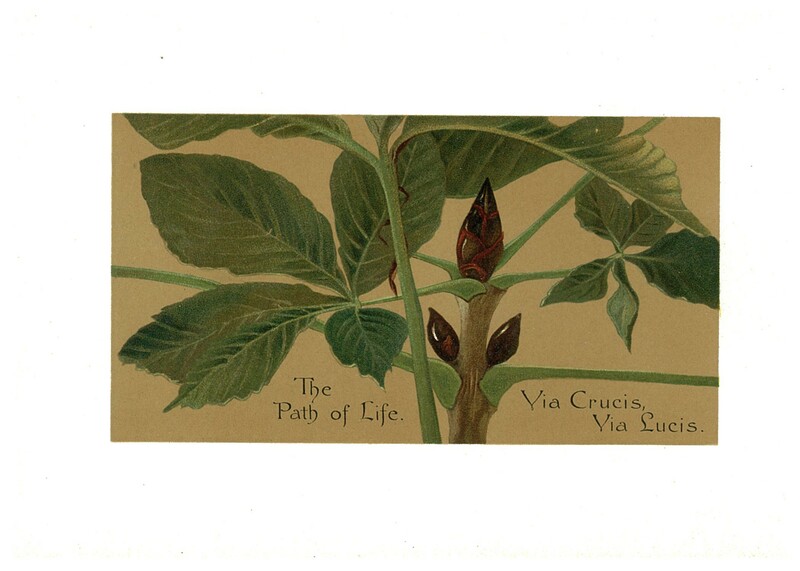 “Via Crucis; Via Lucis.” With these words, Lilias sets forth the premise of her classic devotional, The Parables of the Cross, which explores this paradoxical truth: The Way of the Cross; The Way of Light. Observing the stages of a plant’s growth, “its budding and blossoming and seedbearing,” she draws a vital lesson: the lesson of death in its delivering power. The path of life. The season of Lent, more than other of the church calendar, focuses on the darker side of the Christian faith. Dying. Dying to self. Dying to live. This is reflected in our Sunday worship – Scripture, music, prayers. Depending on ones personal practices, it might also be represented in an action – devotional reading, sacrificial giving, denial of appetites (chocolate, desserts, rarely vegetables!) – to indicate an awareness of this period of suffering leading up the death of Christ. The death that led to life Eternal. For some it is a forty-day period of reflection – and even denial. For me, this year, I must admit, it will be one week. One week when I wear a crucifix – a treasured gift from an appreciative friend – a daily reminder of the suffering of Jesus. I will make a determined effort to focus my heart and mind on scriptures and texts of hymns that train my spirit to reflect and repent and return to the heart of God. One week. Small acknowledgment of a big gift. But even that is discipline to my wayward heart. My mind wanders. There are joyous moments during this somber commemoration. Phone conversations with friends. Facebook posts with pictures of grand children. Dinner out. A walk downtown. A bit of gardening. Some baking. Preparations for Resurrection Sunday. Can’t stay somber long, it seems. And it comes to me that life is, indeed, a mix of sorrow and joy. Even that last long week of Jesus on earth – Passion Week – was threaded with joy: visits in the home of friends, one last lingering supper with His closest disciples. And just as joy and sorrow are mingled, so are death and life. It is an ongoing interconnected process. Unrelenting sorrow would be unbearable. Never-ending joy unimaginable. It is, in fact, our very sorrows that so often turn us to God. It is in that crucible of suffering that we begin to die more fully to self – so that we can live more completely for God. Shadow and light merge. So this is a message for the week ahead. Mountains and valleys. Light and darkness. Joy and sorrow. Life and death. They are all present, to different degrees. I will attempt to walk the path of the cross – with Christ – but I know that as I do the way of life is ahead: glorious and dazzling. The Resurrection of Jesus! Breaking the power of death now – and for eternity. Hosanna! Blessed be the name of the Lord. * A facsimile edition of Parables of the Cross (1895) is available at Amazon. This entry was posted in Lent, life, light, suffering and tagged art, Lent, Lilias Trotter, Parables of the Cross, Rick Warren. Bookmark the permalink. Thank you Miriam. I have missed your reflections. I cherish my copy of The Parables of the Cross. You have unpacked this thought beautifully. Thank you. I needed it today. Thank you, Cheryl. You are such an encouragement. . . I can picture you in your chapel and wonder what new devotional treasures you have unearthed? Pam! Thank you! I love hearing from you. We must catch up soon. . .
I’m so glad that you enjoyed it. Lilias is a great subject!